SOUTH BEND — The Mayors’ Ride, which invites bicyclists to spin along bike routes by the St. Joseph River, will return May 7 for the second year with only a small change in its route. The free bike ride will run between 8 a.m. and noon that Sunday. 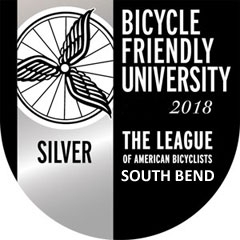 Bicyclists of all ages will be able to join it at any time in those four hours, starting at either St. Patrick’s County Park or Howard Park in South Bend or at Central Park in Mishawaka. An obstacle course, inflatable play equipment and food trucks will be posted at Howard Park, said Aaron Perri, director of the city’s Venues, Parks and Arts, at a news conference Monday to promote the event. And there will be cookies, fruit and water at all three stops. Police from South Bend, Mishawaka and St. Joseph County will once again be on hand to help with safety at key intersections, said Pete Jank, president of the Bike Michiana Coalition.